in a window at the practice. 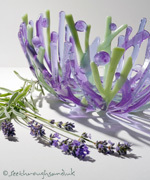 Decorative bowl: a special birthday gift to reflect the recipients favourite flower. 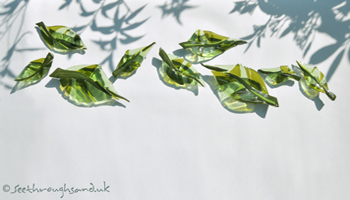 Art installations: a series of summer leaves that tumble across a conservatory wall. Artwork covers c. 2 metres. 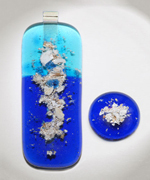 Fused glass as an art form is a diverse and creative medium. 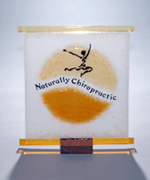 It is incredibly flexible and sometimes unpredictable. All work is designed and made with that in mind. No two pieces are ever intended to be the same and even if they were, the glass often surprises. The fun is in creating something that is special and unique. Palau: Reef Series #1 (right) was awarded a gold medal and was the category winner at the Dorset Arts and Crafts Association, 2017 Exhibition. 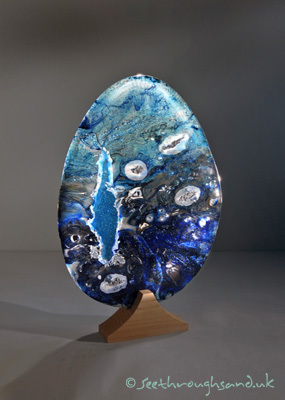 The underlying image, Fractured Ocean also received a gold.